Although smartphones are already incredibly handy, serving to some extent as a watch, a calculator, a notepad, an audio and video recorder, a level, a pedometer, a dim flashlight and so much more, a new Kickstarter project aims to push that functionality even further. The "Sensordrone" is pitched as your smartphone's sixth sense, allowing it to run hundreds of previously unsupported applications. 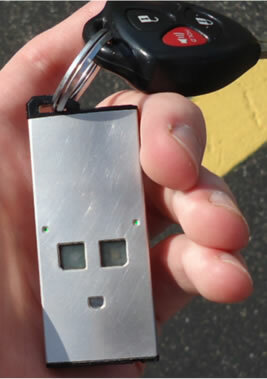 The device is small enough to fit on your keychain and contains a ton of sensors for just about anything you can think of. It can be used to measure various gases, such as carbon monoxide, ozone, nitrogen dioxide, methane, propane, and alcohol, as well as temperature (non-contact via infrared), humidity, pressure (air, blood etc. ), proximity (fluid level, stud finder etc. ), as well as color and light levels. In other words, the Sensordrone is a Swiss Army Knife of environmental input. The developers currently have six applications for their device, including a breathalyzer with an intoxication meter, an infrared thermometer that can, among other things, help you make the perfect cup of coffee, as well as an application that helps you achieve the perfect humidity level in your refrigerator's vegetable drawer. Although the Sensordrone's data-gathering abilities are cool enough, it'll be more interesting to see how developers actually use that information. For instance, the Sensordrone's creators suggest that the breathalyzer application could contact a designated driver if you're too wasted to get behind the wheel. With all of its input methods, the device could also lead to some unique mobile game concepts. The Sensordrone uses Bluetooth to interface with iOS and Android devices and other platforms will be supported later. As of writing, the project has 165 backers and has raised $24,747 of its $25,000 goal with 40 days remaining. The device will retail for $199, but as usual, there are various rewards for your pledge and if you submit $175 or more, you'll get a general production unit ($345 for two).